This beautiful plate is made of solid forged brass that is copper plated, then hand finished to the popular oil rubbed bronze finish. Dark mahogany tone with copper undertones showing through the finish. 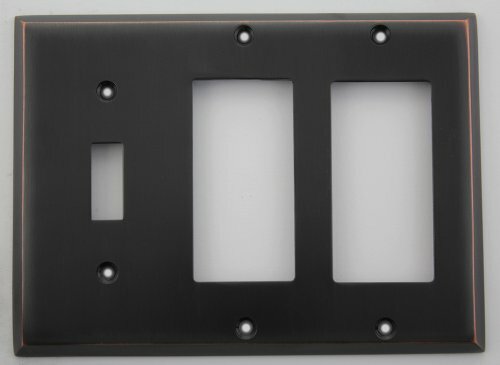 The three gang wall plate will accommodate one standard toggle light switch and two GFI outlets, rocker switches or any other rocker-style opening devise. Plate measures 4 5/8" by 6 1/4"
Plate measures 4 5/8" by 6 1/4"